Chris - First of all, can we just run through the basic process that enables us to make cheese. How does it get made? Martin - It starts with a lactic acid bacterial culture that is added to the milk and once that lactic acid culture starts working, it converts the milk sugar lactose to lactic acid and then an enzyme preparation called rennet is added which causes the casein in the milk, the milk protein, to coagulate and so the whole of the milk forms a solid coagulant. All the while, the bacteria carry on producing acid from the lactose in the milk, the coagulant is then cut and when it's cut, it starts to separate into curds and whey - the liquid phase. Then it goes through various sorts of manipulations to separate the curd from the whey, and you end up with the curd which goes to make the cheese. It's essentially those simple processes by slight variations in them. I forgot to mention at the very end of course, the curds are sorted. And those are the of basic steps of lactic fermentation, addition of the enzyme, the curd cutting, the removal of whey and sorting, just by slight variations in that, you can make this huge array of different cheeses. Chris - So the bacteria that are added right at the beginning that do this souring process, the lactic acid bacteria, they're presumably quite a special strain of bacteria that are used to do that? Martin - Yes and normally, in the case of cheddar cheese making, an organism called Lactococcus lactis and, traditionally, these would've been naturally present in the dairy environment but of course nowadays they need to be much more assured of control of these processes and so, they add a starter culture as of Lactococcus lactis that is produced industrially, and those bacteria are the primary microflora. Chris - Just opening this one here. So I've got a cheddar here. It's a very firm cheese, but still nonetheless quite springy and moist. It's quite tasty. It's got a sharp taste to it. What actually goes into making say, a cheddar like this? How would you do that? Martin - Well the first stage, the lactic acid production by the primary starter culture is really just the start of it, you end up with a curd that has been salted and when you add the salt, the starter culture stops growing because it's inhibited by the salt. But what happens in cheddar cheese, at it matures or ripens, you get a secondary microflora, which are known as nonstarter lactic acid bacteria, and these have not been added they're just naturally present in the milk or in the environment and they get into the cheese, and these grow up to levels about 10 million per gram in the course of a few weeks of ripening. It's a combination of proteolytic enzymes and lipolytic enzymes that are still present from the starter organism (although the starter organism can't grow any longer, its enzymes can still be active). There's also a residual proteolytic activity from the rennet that's been added, and there's enzyme activities from these non-starter lactic acid bacteria. And so, particularly in the case of cheddar, they break down the proteins to produce peptides that give that sort of meaty, savoury, salty flavour to the product. As the cheese matures, that flavour becomes stronger. Chris - That's a very high bacterial density, isn't it? Does that then mean that quite a significant weight of the cheese that you're eating does contain viable bacteria. If I took my block of cheddar here and I actually did a gram stain for microorganisms under a microscope would I see viable organisms in there? Martin - Yes, you should be able to see the non-starter bacteria. Normally, they're rod-shaped bacteria. The starter used in cheddar cheese making, Lactococcus lactis, is a spherical bacterium whereas the most common non-starter lactic acid bacteria are Lactobacillus casei and Lactobacillus paracasei. So they'd be quite evident. Chris - So does it make a difference if you use pasteurised milk which has effectively been rendered sterile then? You would presumably have to put those back in? Martin - Well you don't, that's the interesting thing. Certainly, people claim that if you use unpasteurised milk, you get a much more flavoursome cheese because you don't destroy the natural flora of the milk. But even if you pasteurise the milk, some of these bacteria might survive pasteurisation, but others may just be present in the environment and they grow as biofilms on equipments and so on, so they just naturally contaminate the environment, but in a good way. Chris - That's convenient. Now the other cheese I've got here is a bit whiffy and this one is a blue cheese. This is very different. If I take a slice through this one, I see that this is A) Absolutely riddled with holes and B) A lot of those holes are full of what looks like the same stuff that grows on your loaf when it goes mouldy. Martin - The first stage in making a stilton cheese would be similar to cheddar in that they would either start a culture which produces lactic acid from the lactose in the milk, but they would also add mould spores. 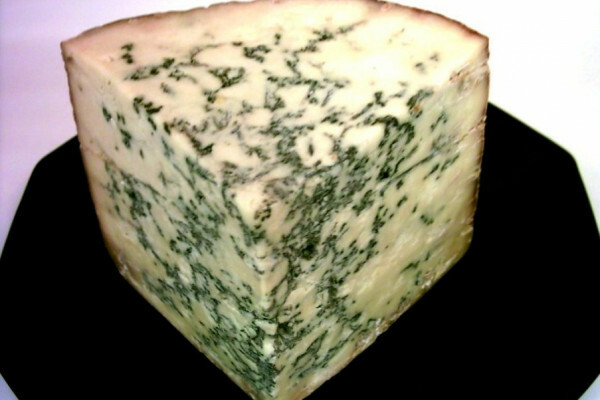 In blue cheese, the mould is Penicillium roqueforti. Moulds need air to grow, so they make the cheese in a way to have a fairly open texture with some sort of cracks in it to have some air there. They also stick needles through the blocks of cheese, and if you look very carefully at a substantial-sized piece of stilton, you'll see the tracks of these holes where they put needles through to allow air into the cheese, to allow the mould's spores to germinate and the mould mycelium to grow throughout the cheese. The blue colour you actually see is the mould's spores when the mould has sporelated. Chris - And what about the flavour? Is that imparted by the growth of that mould inside the cheese? Martin - Yes, very much so. The mould is much more metabolically active, and produces lipases and proteases, and produces a whole range of breakdown products from the components in the cheese - things like methyl ketones, lactones, fatty acids, and so on - all of which give the characteristic flavour to that cheese.